Satellite Gravitational Gradiometry (SGG) is an observational technique of globally establishing the fine structure and the characteristics of the external Earth’s gravitational field. The “Gravity field and steady-state Ocean Circulation Explorer” GOCE (2009–2013) was the first satellite of ESA’s satellite programme intended to realize the principle of SGG and to deliver useful SGG-data sets. In fact, GOCE was capable to provide suitable data material of homogeneous quality and high data density. Mathematically, SGG demands the determination of the gravitational potential in the exterior of the Earth including its surface from given data of the gravitational Hesse tensor along the satellite orbit. For purposes of modeling we are led to invert the “upward continuation”-operator resulting from the Abel–Poisson integral formula of potential theory. This approach requires the solution of a tensorial Fredholm integral equation of the first kind relating the desired Earth’s gravitational potential to the measured orbital gravitational gradient acceleration. The integral equation constitutes an exponentially ill-posed problem of the theory of inverse problems, which inevitably needs two regularization processes, namely “downward continuation” and (weak or strong) “error regularization” in the case of noisy data. This contribution deals with two different SGG-multiscale regularization methods, one in space domain and the other in frequency domain. Both procedures provide the gravitational potential as derived from tensorial SGG-data along the satellite orbit on the real Earth’s surface as required from the view point of geodesy. Gravitationsgradiometrie mittels Satelliten (SGG) ist eine Meßtechnik zur globalen Bestimmung der Feinstruktur und der Eigenschaften des Gravitationsfeldes im Außenraum der Erde samt Erdoberfläche. Der ESA-Satellit GOCE (2009–2013) war der erste, dessen Aufgabe es war, das Prinzip SGG umzusetzen und brauchbare SGG-Daten zu liefern. 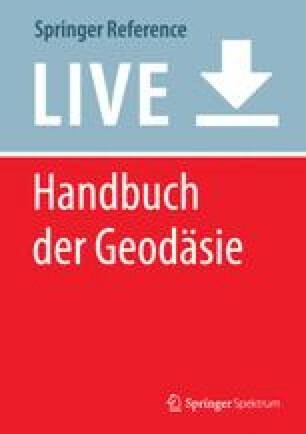 GOCE gelang es in der Tat, Datenmaterial in einheitlicher Qualität und hoher Datendichte bereitzustellen. Mathematisch erfordert SGG die Bestimmung des Gravitationspotentials im Außenraum der Erde unter Einschluss der Erdoberfläche aus vorgegebenen Daten des Hesse-Tensors des Gravitationspotentials auf dem Satellitenorbit. Die Modellierung führt auf die Inversion des ,,upward continuation“-Operators, der aus der Abel-Poissonschen Integralformel der Potentialtheorie resultiert. Dieser Zugang erfordert die Lösung einer tensoriellen Fredholmschen Integralgleichung erster Art, die das Gravitationspotential im Außenraum der Erde zu entlang des Orbits gemessenen Gravitationsgradientbeschleunigungen in Beziehung setzt. Zur Lösung der Integralgleichung ist ein exponentiell schlecht-gestelltes Problem der Therorie inverser Probleme zu bewältigen, das unvermeidlich zweier Regularisierungprozesse bedarf, nämlich ,,downward continuation“ und (schwache oder starke) ,,Fehler-Regularisierung“ im Falle verrauschter Daten. Dieser Beitrag beschäftigt sich mit zwei verschiedenen SGG-Multiskalen-Regularisierungsmethoden, eine im Ortsbereich und eine andere im Frequenzbereich. Beide Zugänge liefern das Gravitationspotential – in der Tat wie aus geodätischer Sicht gefordert – auf der tatsächlichen Erdoberfläche aus tensoriellen, entlang von Satellitenorbits gemessenen SGG-Daten. W. Freeden and H. Nutz thank the “Federal Ministry for Economic Affairs and Energy, Berlin” and the “Project Management Jülich” for funding the project “SPE” (funding reference number 0324016, CBM – Gesellschaft für Consulting, Business und Management mbH, Bexbach, Germany) on gravimetric potential methods in geothermal exploration.